The San Francisco 49ers are on the board, with their 31-21 win over the New York Giants in Levi’s Stadium being their first of the season. QB C.J. Beathard had easily the best game of his young professional career, with 11.5 yards per attempt and two touchdowns to one interception, and he also added in a rushing touchdown. Running backs Carlos Hyde and Matt Breida chipped in as well, rushing for a combined 153 yards and a touchdown. QB Eli Manning had a solid performance, with two touchdowns and 273 passing yards. RB Orleans Darkwa ran well versus a very good 49ers defensive front, but the Giants couldn’t muster enough points to get the win. With that, we give you our PFF exclusive takeaways from the contest for each team. Beathard finished 19-of-25 passing for 288 yards with two touchdowns and a dropped pass. He completed 2-of-3 deep pass attempts for 103 yards, finding Marquise Goodwin for a 83-yard score. Beathard finished 7-of-9 passing off of play action for 86 yards and also ran in a score on a naked bootleg play action pass. Hyde forced three missed tackles rushing on 17 attempts running in the 49ers zone blocking scheme. Hyde burst through the line of scrimmage twice for runs of over 15 yards, demonstrating the patience and vision 49ers fans are hoping for in the zone blocking run scheme. 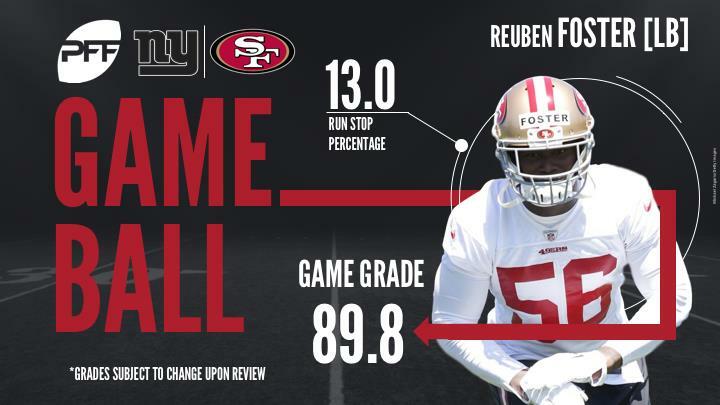 On paper it looked like Eric Reid had a bad game, giving up a passer rating when targeted for 126.4. However this does not do Reid any justice. Reid gave up a touchdown catch which jumped his passer rating up, but the longest catch Reid gave up was 10 yards. Throughout the day, Reid was quick to make a play on the receiver and had one pass knocked down. In a game where the Giants attempted 37 passes, the only receiver who had any success was Sterling Shepard. The 49ers defense had no defender who could match up with him, as Shepard was able to catch a pass against six different defenders who where in coverage against him. With a lot of blame to go around for the one-win Giants this season, Eli Manning is having one of his better seasons in recent memory. Eli was very good when avoiding deep passes, only having two incompletions on passes that were thrown less than 20 yards downfield. Vernon produced a quarterback hit and hurry rushing the passer while adding three stops in run defense. He also managed to corral an interception. Janoris Jenkins had a game to forget in this one. Jenkins yielded four receptions for 111 yards, 46 of which were yards after the catch. Jenkins also missed two tackles in pass coverage and one tackle defending the run.